Detroit's Shinola continuously searches out opportunities to work with American suppliers. Not only does this help to reverse the course of globalization one watch at a time, but it increases awareness for the concept of buying more locally. And, specifically, for bringing manufacturing back to Detroit, Michigan. 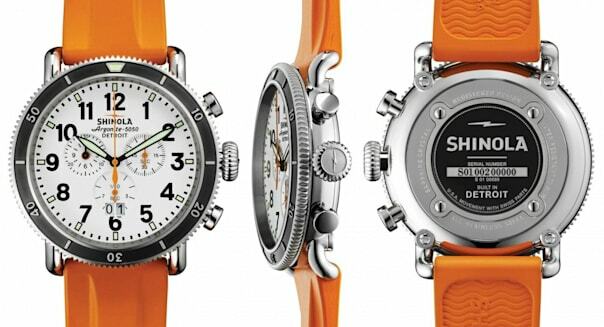 While not all components Shinola uses to manufacture its watches are produced in the U.S.A. (at this time, it is simply not a possibility), the company's management is bound and determined to find ways to make more and more of them in North America. And many of the parts used already are. Some examples are the leather straps that come from Hadley Roma in Largo, Florida and the Horween leather from Illinois that is combined with the paper from Ann Arbor, a suburb of Detroit that is also home to the University of Michigan, to make the brand's journals and notebooks. This fall, Shinola premieres five new Runwell watches on rubber straps. Since the brand's formal introduction at Baselworld 2013, it has introduced various models for both men and women, culminating in the recently released Runwell chronograph. Now some of these models are available on sporty rubber straps. But before we go into the models themselves, let's take a look at the source of these straps. Shinola developed a custom formula for the nitrile rubber together with its partner Stern Manufacturing, which is located in Staples, Minnesota. Developing something on its own rather than buying a component "off the rack," so to speak, helps achieve a defined and refined look – which can often aid in positively characterizing the product's overall visuals. Custom-created straps also help to constitute the expected feel of Shinola's well thought-out products. The straps are created using a nitrile rubber base, which is a synthetic rubber that often comprises the industry standard for watch straps. Stern mixes and molds the rubber entirely in-house in Staples. These straps are not only water-resistant – making them great companions for swimming and water sports – but also resistant to oil, sweat, chemicals, heat, and cold. They have high tensile strength yet great flexibility, giving the strap a solid yet supple feel, and good tear resistance. This also makes them quite comfortable to wear. Stern Manufacturing, founded in 1969, made its name producing industrial-strength rubber items that are built to withstand harsh environments. Stern's expertise paired with Shinola's standards of refinement resulted in premium rubber straps that are built to last. These five new rubber-outfitted Runwell watches will be available in Shinola's online boutique later this month, retailing between $675 for the time-only models and $875 for the chronographs. Most remarkable in this price class is that Shinola offers a lifetime guarantee on the working parts of all its watches. For more on Shinola and Detroit, please read Shinola Installs Vintage-Style City Clocks In Detroit. Sunday is the first day or markdowns, James said, but coming to the store on a Monday you'll typically find a less crowded a store and will see the latest markdowns. And, he said, don't forget the 40 percent off one item coupons Jo-Ann always puts out. The second and fourth Saturday of every month are the two days of the month when Kohl's (KSS) has the biggest markdowns.